While conducting an artist demonstration in Oregon, Betty Feves speaks to a class about how she makes her ceramic work, the pros and cons of working with the raku technique, and the uniqueness of Eastern Oregon clay (c. 1970). Betty Feves delivers a slideshow lecture at Oregon State University about being a student of Clyfford Still and Alexander Archipenko, moving to Pendleton with her husband Louis and raising a family, and how she made a life of working with clay. Courtesy of Feves Family Archives. Interview between Bob Lanman and Namita Gupta Wiggers, Julie Feves and Jinx Whiteman Patterson about apprenticing with Betty Feves in Pendleton. Interview between James Lavadour and Namita Gupta Wiggers about Betty Feves, mentorship and the artist’s responsibility within his or her community. Isaac Callendar interviews Pendleton resident Marjorie Iburg about her friendship with Betty Feves, in conjunction with the exhibition. Curator Namita Wiggers discusses Generations: Betty Feves with a lecture about the influence of ceramicist Betty Feves on the regional and national art scene. Scholar, critic and curator Maria Elena Buszek gives a lecture for Museum of Contemporary Craft and the MFA in Applied Craft and Design as part of the 2011–2012 Graduate Visiting Artist Lecture Series. 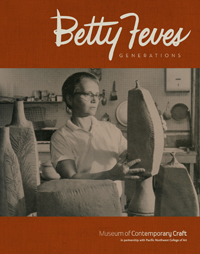 Art historian Jenni Sorkin explores Betty Feves’ career against the backdrop of mid-century modernity and her involvement in the Ceramic Nationals as part of the Generations: Betty Feves exhibition. Architect and educator Chris Taylor gives a lecture titled “Testing Perceptual Thresholds with Land Arts of the American West” for the 2011-2012 Graduate Visiting Artist Lecture Series and in conjunction with Generations: Betty Feves. Curator Namita Wiggers phoned in from the Feves Home in Pendleton to be interviewed on Oregon Public Broadcasting's Think Out Loud. Oregon Public Broadcasting's Oregon Art Beat featured the Generations: Betty Feves exhibition. The segment aired Thursday, April 26, 2012. The segment can be viewed on Oregon Art Beat. Generations: Betty Feves is the first Museum retrospective to honor the legacy of one of Oregon’s important arts leaders. Betty Whiteman Feves (1918–1985) belongs to a generation of mid-century vanguard artists who set the stage for dynamic shifts in the use of clay in art. Featuring over 150 objects ranging from her student work in the 1930s to her final projects in the early 1980s, the exhibition spans themes that guided Feves’ work throughout her lifetime: figures, dwellings, sculptural slab structures, pottery, bonfire and raku pots, and large architectural installations. An advocate for living locally throughout her lifetime, Feves created her own clay bodies and glazes using materials in her immediate environment, taught art in her community, shared her musical talent through private violin lessons for area schoolchildren, and brought the Suzuki method for violin to the Pendleton schools. She mentored numerous younger artists and advocated for the arts in education by serving on the Pendleton school board as well as the State Board for Higher Education. In 1977, Feves was one of the first recipients of the Governor’s Arts Award for the State of Oregon for which she was recognized for both art and music. Her rise to national prominence was rapid with nearly simultaneous exhibition debuts in 1952 on both the West and East coasts in the Third Annual Exhibition of Northwest Ceramics, Oregon Ceramic Studio (now Museum of Contemporary Craft) and the 17th Ceramic National, Syracuse Museum of Fine Arts (now Everson Museum of Art), NY. Her dedication to her work, to experimentation, and to understanding the medium of clay contributed to the establishment of the American Craft Movement. The exhibition concludes the 75th Anniversary celebration of the Museum of Contemporary Craft. Founded in 1937 by Lydia Herrick Hodge and a corps of women volunteers as the Oregon Ceramic Studio, the Museum is the oldest organization dedicated to modern and contemporary craft in the United States and now operates in partnership with Pacific Northwest College of Art. Generations: Betty Feves celebrates leadership in the arts and the role women have played in shaping the cultural climate of Oregon today. The exhibition is accompanied by a 192-page, full-color publication, available for sale online, in The Gallery, or by calling 503 546 2654.